Many Samford University students will undertake service and mission projects during spring break March 21–25. Some may help brighten a sick youngster’s day with dabs of face paint or a pony ride. Others will inspire through their musical gifts or help provide clean drinking water to families in need. Volunteer efforts range from Samford-sponsored group trips to individual participation in endeavors coordinated by churches and nonprofit ministries. Ten students will travel to Orlando, Florida, to participate in a service immersion experience sponsored by Samford’s Mann Center for Ethics and Leadership. They will work at Give Kids the World, a nonprofit storybook resort that offers cost-free vacations for children with life-threatening illnesses and their families. There, the Samford students will assist in multiple areas of the park. They may serve the kids ice cream for breakfast, assist with pony rides or face painting, help put on plays and other entertainment programs, or handle landscaping and other maintenance chores. The Samford participants have been preparing diligently for the experience, said team leader and Mann Center assistant director Cameron Collins. All are attending an orientation and three training sessions prior to leaving campus, he said. “During these sessions, students are challenged to think about the correlation between faith and service, as well as the struggles facing families of children with life-threatening illnesses. These sessions have helped expose the students to programs in both the global and domestic health-care systems,” Collins said, adding that the students also received basic training on how to best assist the families. Once on site, the team will have daily reflection sessions and will later share in a debriefing session after they return to Birmingham. This is the fifth annual spring break service immersion trip sponsored by the Mann Center. School of the Arts dean Joseph Hopkins will lead a 20-member group of Samford students, recent graduates and other volunteers on a mission trip to the Dominican Republic. “The trip will track many of the opportunities and relationships built through the Samford orchestra and jazz tour in 2014,” Hopkins said. This year’s team will lead worship, present praise concerts and some outdoor nonsacred concerts, and use music to work with children. They expect to teach music and perform at an orphanage, a church academy of music, and at a new government project in one of the poorest areas of the Dominican Republic. The week-long effort is sponsored by Samford’s closest church neighbor on Lakeshore Drive, First Baptist Church of Birmingham. Another group of Samford students and staff personnel will travel to Haiti with Filter of Hope ministry to distribute water filters to impoverished neighborhoods about 50 miles north of Port-au-Prince. The group of eight includes two veteran Haiti volunteers, sophomore English major Bailey Bridgeman and Samford director of student activities and events Paige Acker. “We went to Haiti last spring break and loved it so much that we felt called to go back,” said Bridgeman, who said their work in 2015 was at an orphanage. Junior communication sciences and disorders major Emily Springer is among scores of Samford-connected volunteers fanning out across the United States during spring break. She will work in New York City with North American Mission Board missionaries Drew and Emily Griffin, who are starting a church in Manhattan’s Upper East Side neighborhood of Yorkville, home to about 70,000 people. “Their hope is to spread the gospel to the tens of thousands who live in their neighborhood. They are the only evangelical church in their entire neighborhood,” explained Springer, who is part of a team sponsored by Birmingham’s Shades Mountain Baptist Church. The group includes about a dozen other Samford students. Service to others at a time when many college students are basking in sunshine on beaches or catching up on sleep is not unnoticed by Samford President Andrew Westmoreland. 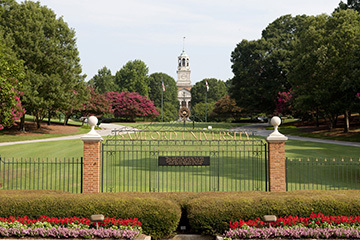 Most Samford students will be off Easter Monday, March 28.